Melt butter in large skillet on medium-high heat. Stir in flour. Cook 4 minutes or until golden brown, stirring frequently. Add green pepper, onion, celery and garlic; cook 2 to 3 minutes or until crisp-tender, stirring occasionally. Add turkey sausage, tomatoes, broth, okra, bay leaf and thyme; stir until well blended. Season with salt and black pepper. Bring to boil. Reduce heat to medium-low; cover. Simmer 5 minutes, stirring occasionally. 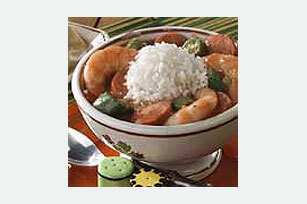 Stir in shrimp; cook 5 minutes or until shrimp are opaque, stirring frequently. Remove and discard bay leaf. Spoon over hot rice. Substitute 1 pkg. (10 oz.) frozen cut green beans for the okra.